Seed Cake Dry a pound of flour then put two pound of butter into it beat ten eggs leave out five whites then put to them eight spoonfulls of cream six of ale yeast run it through a sieve into the batter, and work them well together and leave it a 1/4 of an hour before the fire, then work into it one pound of rough carraways, less than one hour will bake it. 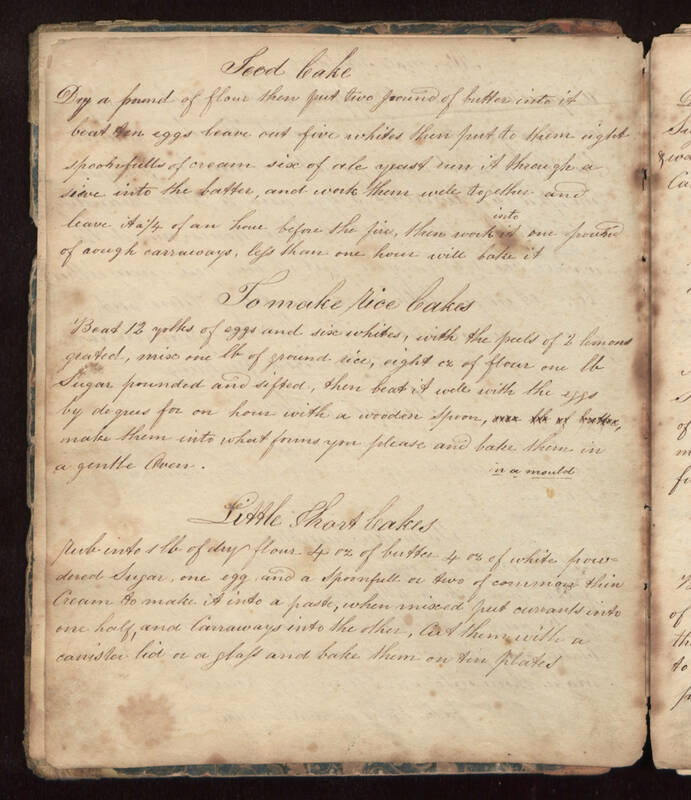 To make rice Cakes Beat 12 yolks of eggs and six whites, with the peels of 2 lemons grated, mix one lb of ground rice, eight oz of flour one lb Sugar pounded and sifted, then beat it well with the eggs by degrees for an hour with a wooden spoon, make them into what forms you please and bake them in a gently oven in a mould. Little Short Cakes Rub into 1 lb of dry flour 4 oz of butter 4 oz of white powdered Sugar, one egg and a Spoonfull or two of common thin Cream to make it into a paste, when mixed put currants into one half, and Carraways into the other. Cut them with a canister lid or a glass and bake them on tin plates.